NEW YORK (AP) — Kirsten Gillibrand is hitting the television daily double this week. The New York senator announced her presidential candidacy on Stephen Colbert’s “Late Show,” following it up with an MSNBC interview Wednesday with Rachel Maddow. Her itinerary reflects the importance of those two media figures to the expected crowd of Democrats seeking President Donald Trump’s job. They are dream bookings for campaign aides. Gillibrand followed Massachusetts Sen. Elizabeth Warren, who was interviewed by Maddow on Jan. 2. 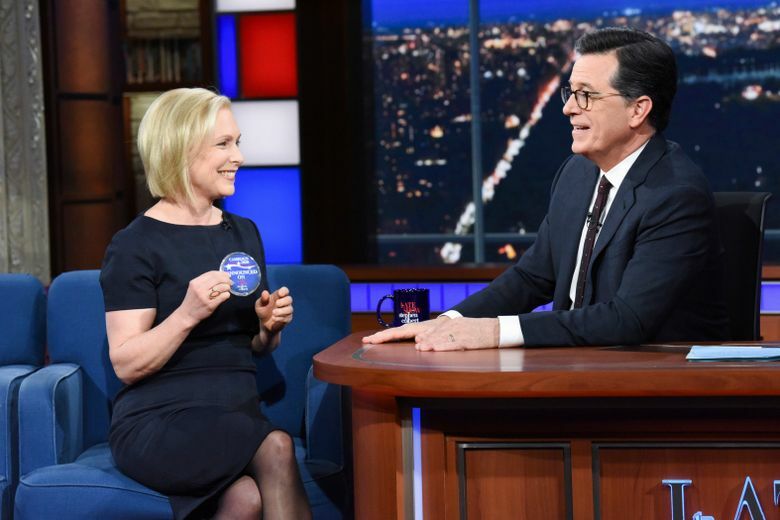 California Sen. Kamala Harris and former Housing Secretary Julian Castro have appeared with Colbert over the past month, but only Gillibrand earned a special “I announced on the ‘Late Show with Stephen Colbert'” pin. Colbert’s withering comic take on Trump has taken him to the top of late-night ratings. Since targeting Trump hardly makes him unique among TV comics, his success gives the “Late Show” particular cache. So far this season he’s averaging 3.76 million viewers a night, compared to 2.49 million for NBC’s Jimmy Fallon and 2.07 million for ABC’s Jimmy Kimmel, according to the Nielsen company. Maddow averaged 2.8 million viewers each night during the last three months of 2018, running neck-and-neck with Fox News Channel’s Sean Hannity for first place in cable news. She offers a unique targeting opportunity, with an audience largely eager to see Trump go. A 2014 Pew Research Center study found that 61 percent of people who said they recently got politics news from her show were Democrats, compared to 2 percent Republicans. The rest were independent. The programs aren’t talking publicly about their strategies for offering outlets to candidates. Just by watching him on the air, Colbert seems to relish his role. He pressed both Castro and Harris to declare their candidacies, and seemed upset with political reticence. “I might,” Harris said. Castro later made it official, while Harris hasn’t yet. Gillibrand was clearly nervous at the beginning of her appearance, fielding basic questions about why she was running. Late-night guest shots require politicians to let their guard down and reveal personality to an audience unfamiliar with them, while still trying to get a political message across, Psaki said. “These shows are a lot harder than people think they are,” she said. Announcing a candidacy on Colbert also reflects the growing importance of non-traditional media. Politicians can no longer be sure that people will see an announcement address from a podium in front of a majestic background. “You have to think about meeting people where they are,” said Psaki, now a CNN analyst. Gillibrand loosened up as her “Late Show” appearance went on, and took the bait when Colbert noted her penchant for swearing. He asked which word she’ll miss the most on the campaign trail. “Rhymes with duck,” she replied. Like with Maddow’s show, Pfeiffer’s “Pod Save America” could offer presidential candidates to an audience packed with party activists. It did not seek to take sides in primary fights during the 2018 midterms, so the show is still working out the details of opportunities that will be offered to 2020 candidates, he said. More so than in previous campaigns, 2020 candidates are likely to seek ways to let voters know more about them without media filters, the political pros said. New U.S. Rep. Alexandria Ocasio-Cortez, D-N.Y., is providing a blueprint for how a younger generation of politicians can use social media to advance their message and maintain a high profile, although some of her plain-spokenness may not translate to older, more cautious candidates. More likely, campaigns are studying how Beto O’Rourke used streaming to connect with voters during his campaign for U.S. Senate in Texas last year. O’Rourke, who’s considering a presidential run of his own, recently live-streamed a visit to the dentist on Instagram and talked about border security while getting his teeth cleaned. That example seemed clearly on Warren’s mind when she made an Instagram video discussing her candidacy while she cracked open a bottle of beer. Such efforts come with a real risk if the candidates just look like they’re copying someone else. “Whatever you do, it has to be authentic to yourself,” Pfeiffer said. This story corrects the spelling of Emily Gertler’s last name.